This 1600 miles road trip through Central California will take you from the stormy coast to the deserts and snow-covered mountains, and along the way you get to enjoy wildflowers, ghost towns, rock formations, and lots of adventures. Starting in the SF Bay area, heading south on CA-101, you will have nine opportunities, before turning east, to stop and visit one of California’s historic Missions. Having visited most of them before, I decided to re-visit Mission San Miguel Arcangel in San Miguel, as this Mission is special to me. It had been badly damaged by an earthquake in 2003, and was closed for many years. Not until it reopened in October 2009 was I able to see the beautiful, well preserved interior of the church. During my visit this time, I had the fortunate timing to arrive at Mission Sam Miguel while it was alive with a bilingual (English-Spanish) wedding ceremony in the Mission church, and a Semana Santa religious enactment by the local community in the courtyard of the Mission. Soon after San Miguel, I left CA-101 to turn inland on CA-58, towards the Carrizo Plain National Monument. California, for the most part, was blessed with an abundance of rain and snow in the winter of 2016/17, and these rains brought our deserts alive. 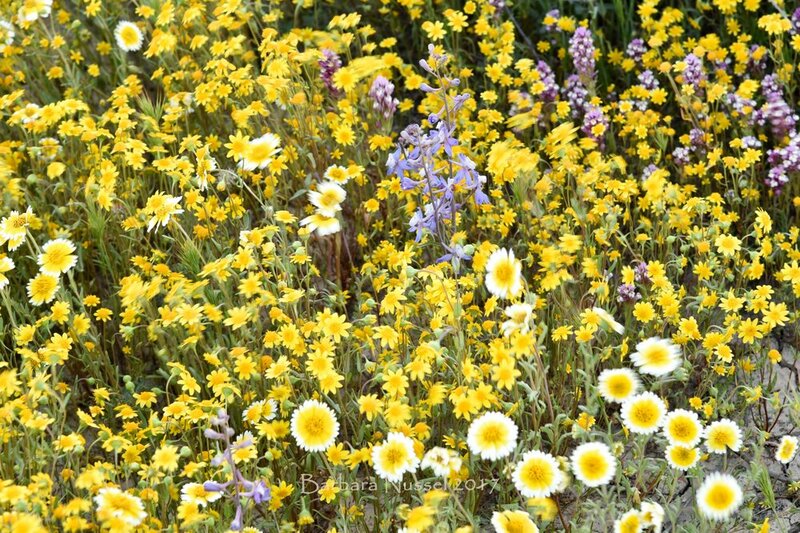 From the phenomenal “Super Bloom” in the Carrizo Plain to the green hills when driving through the Tehachapi Mountains to Mojave, along every water runoff, along every wash, you will find flowers! They come in all shapes and colors – big and small, delicate, fragrant, white or red, and fifty shades of yellow or blue. A “Super Bloom” in the desert is something very special. It happens only maybe once every decade, as all the conditions have to be just right. Seeing the hills or plains carpeted in flowers will keep you awestruck. The desert is a beautiful, but also very fragile landscape! It pains to see these wildflowers trampled down, just so someone can have their picture taken sitting in a field of flower, or flowers being picked for a social media post of “me with flowers in my hair”. Quite a few Rangers in various parks were telling me that these Super Blooms are a real doubled-edge sword. On the one hand, as news and photos of the bloom spread through social media, many more people are visiting the parks. During last year’s Super Bloom in Death Valley, 3-4 times as many people as usual, were visiting this National Park. On the other hand, the parks and Rangers are often overwhelmed by this flood of flower lovers, especially when people stray from established trails, don’t adhere to the posted rules, don’t behave properly. Driving through the Mojave Desert, you will notice large-scale solar panel installations, so called “solar farms”, because one thing the desert has in abundance is sunshine. Many people look at a desert landscape and they only see a barren landscape, but the desert is beautiful, it’s alive, and it’s very, very fragile. I am all for solar power, but let’s not destroy pristine desert landscapes with solar farms! Let’s put the solar panels where we humans already changed the environment. Let’s put the solar panels on shopping malls, parking lots, landfills, …..
Leaving CA-58 in Mojave, I turned northeast on CA-14, which will take you right by Red Rock Canyon State Park. Seeing its spectacular, colorful rock formations, I had to stop for some easy hikes in the Red Cliffs area and Hagen Canyon. There is much more to explore there than what I did, and you can easily add a couple of days to the road trip right here. The weather conditions this winter have not been right for a wildflower super bloom in this area, but nevertheless I found plenty of wildflowers on my hikes. 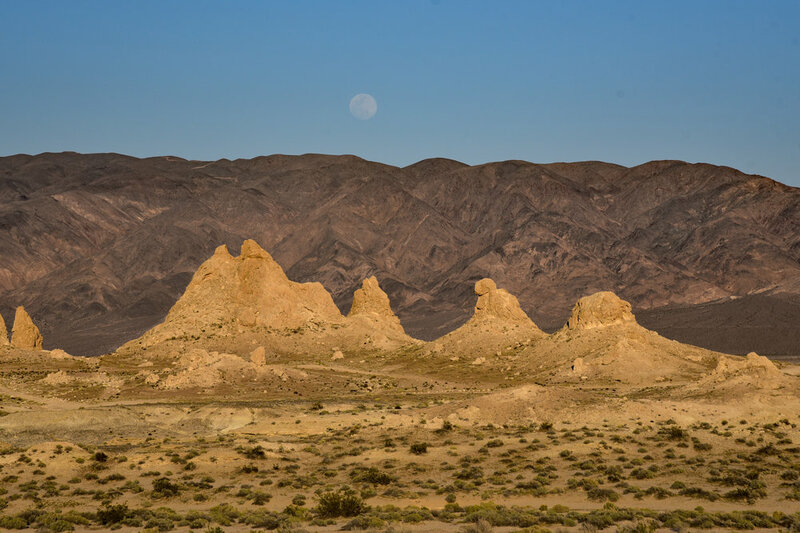 After a few hours at Red Rock Canyon State Park I continued on to the Trona Pinnacles, a National Natural Landmark, about 25 miles east of Ridgecrest, in the middle of nowhere. After a very slow crawl over 7 miles of gravel/dirt washboard road, better suited for an all-terrain vehicle than my brand new VW Golf, I arrived at this very unusual landscape made up of more than 500 spires, some as high as 140 feet, rising from the bed of the Searles Dry Lake basin. 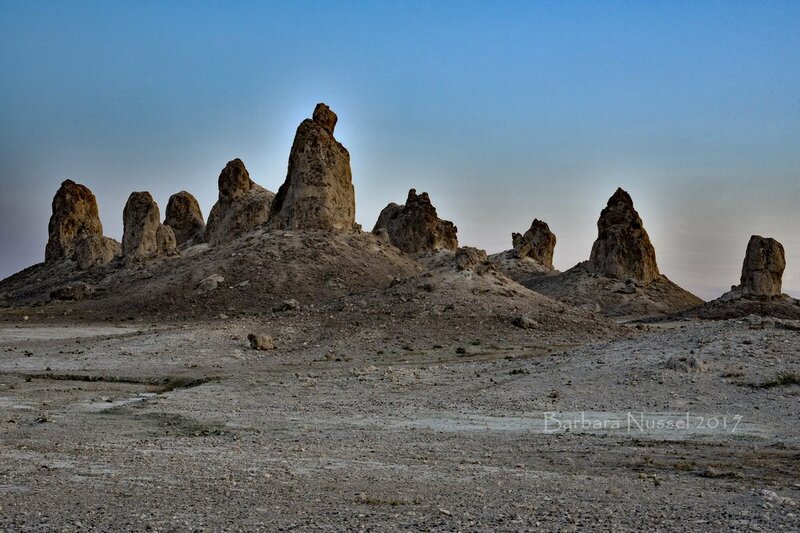 The pinnacles vary in size and shape from short and wide to tall and thin, and are composed primarily of calcium carbonate (tufa), like those found in Mono Lake. Wandering and exploring around the pinnacles, especially if you time it for sunset, as I did, make it well worth the rattling drive. Continuing on towards Death Valley, I passed through the town of Trona, named for the chemical (sodium carbonate) used to make soda ash, which is one of the ingredients in the glass making process. The town was designed in 1914 to house the workforce of the American Trona Corp., a mineral mining company. But as in so many other mining towns, the town population grows or shrinks depending on how the mine is doing. 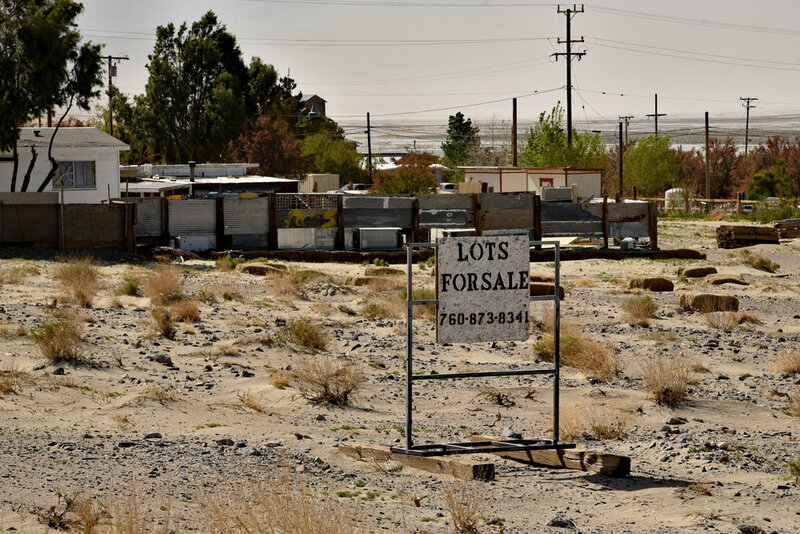 Well, I’d call Trona “a ghost town in the making”. Abandoned houses, next to ones still occupied, no more gas at the EZ Serve Gas station. But the wildflowers bloom, and beautify the abandoned properties, undisturbed by humans. Driving through this town brings history to life. I have visited a very well-known California ghost town, Bodie, many times. Bodie didn’t become a ghost town over night; it was a slow death with the post office operating until 1942. It was very interesting for me to see the very same process happening today, here in Trona. Trona’s population had once peaked at 7,000, but is down to about 1,000.The mine is the life blood of the town. As the mine dies, so does the town. Heading out of town, I saw a large billboard saying “Prayer changes everything”. I don’t think prayer will save Trona. Leaving Trona behind, as I drive through miles and miles of desert, in the comfort of a new, modern car, I cannot help but think about those courageous pioneers who crossed the California deserts in their wagons, without detailed maps or GPS. So many mountain ranges, so many deserts in between the mountain ranges, before you finally make it to the coast. After every mountain range you scale, comes another desert basin to cross. How many mountains, how many more deserts before you finally reach the coast? As I am leaving one of these deserts, Searles Dry Lake, and Trona behind and climbing up the mountain range (Slate Range), which separates me from the next desert (Panamint Flat Dry Lake), I see again beautiful patches of wildflowers along the road at the high elevations. From the car I notice primarily the various yellow ones, but once you get out of the car, you see the others. The delicate, little white ones close to the ground, the solitary deep purple ones, and some big white ones, which almost look out of place for a desert. Coming down into the Panamint Flat Dry Lake desert, there are no more green, no more wildflowers. Another dirt road will take you to the ghost town of Ballarat, but I skipped it, as I wasn’t ready for yet another washboard driving experience. Crossingr one more mountain range, the Panamint Mountains, and I have arrived at Death Valley by late afternoon. Perfect timing for some sunset photography at the Mesquite Flat Sand Dunes! What better ending of this day than following the sunset shoot with catching the full moon rising over the Grapevine Mountains while on my way back to my car. As an interesting side note - I came back the next evening for some more full moon shots, and was really taken by surprise to find out that the moon rise was 45 minutes later than the evening before! Unlike Anzo-BorregoDesert State Park and Carrizo Plains National Monument, Death Valley National Park did not see a super bloom in 2017. There are wildflowers, especially at the higher elevations, but where there had been fields of yellow Desert Gold a year ago, today there were only a few, solitary yellow flowers. On the road from Beatty, NV to Furnace Creek, CA there were various types of yellow flowers and flowering shrubbery right next to the road, almost like guardians to the more delicate ones further in. I know it’s just water run-off from the roads that makes them thrive next to the road, but it feels like those flashy flower patches right next to the roadside protect the more fragile ones from being tramples on, as people won’t venture further in, if they can snap pictures right there at the side of the road. But especially in a normal spring you have to get out of your car and get your eyes close to the ground. 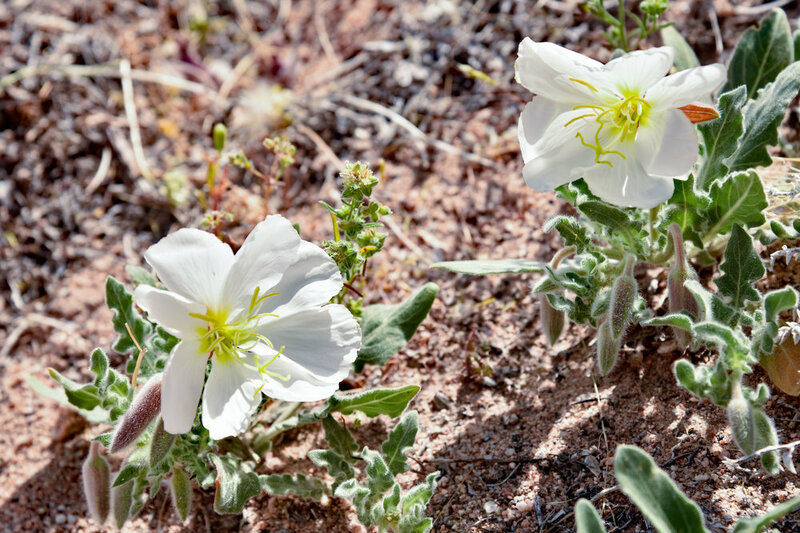 Many desert flowers are not big and flashy but rather delicate, tiny, close to the ground. More and different wildflowers lined the drive up to Dante’s View in the Amargosa Range on the eastern side of Death Valley. Unfortunately it was a totally overcast day and at 5475 ft (1669m) it was cold and the wind was howling, so not the ideal conditions to enjoy the view high above the Badwater Basin. 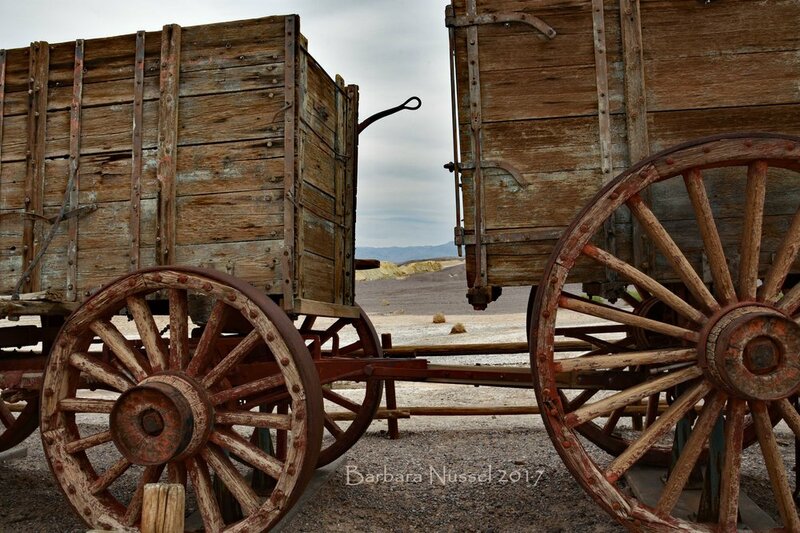 Death Valley has so much to offer, hikes, wildflowers, ghost towns, colorful rock formations, sand dunes, unfortunately a lot of these places are only accessible by high-clearance, four-wheel drive vehicles. Maybe one day when I have exhausted what is accessible with my VW Golf, I’ll rent a Jeep at Furnace Creek. This time I decided to explore the eastern side of Death Valley – Death Valley Junction and Shoshone, and then approach Death Valley from the south end via CA-178 from Shoshone to Badwater. Taking this route, I found more abandoned or almost abandoned places, and I learnt an interesting piece of geography. The Amargosa River (short for the Spanish “aqua amargosa = bitter water"), which originates in the hills north of Beatty flows south, mostly underground, on the eastern side of the Amargosa Range, before making an abrupt turn west and north near the Dumont Dunes to end in Badwater Basin. 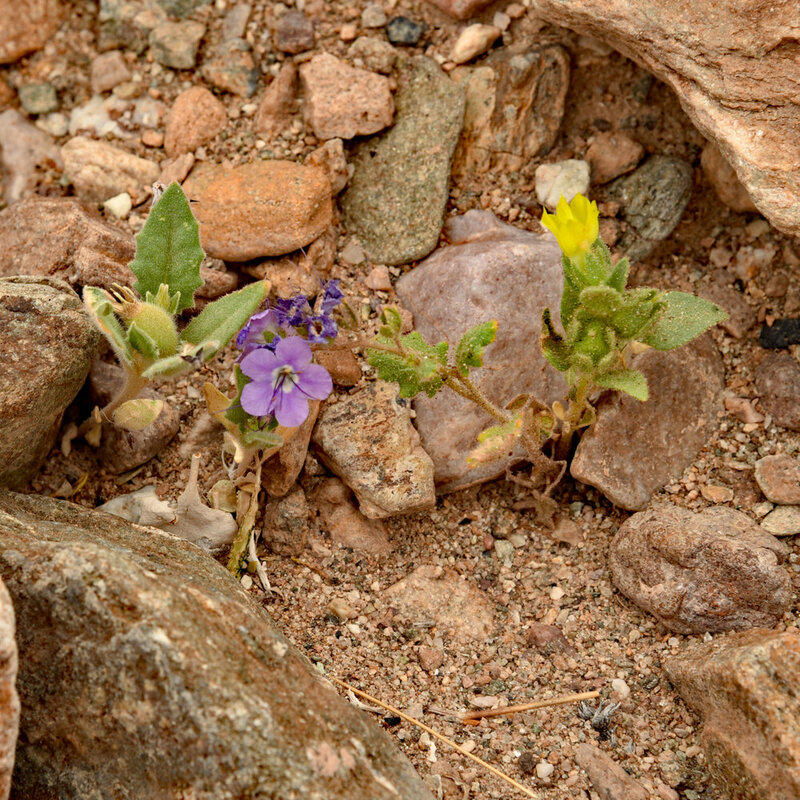 It was also a good route for more beautiful wildflowers as well as another ghost town, the Ashford Mills Ruins, another short-lived mining adventure in Death Valley. 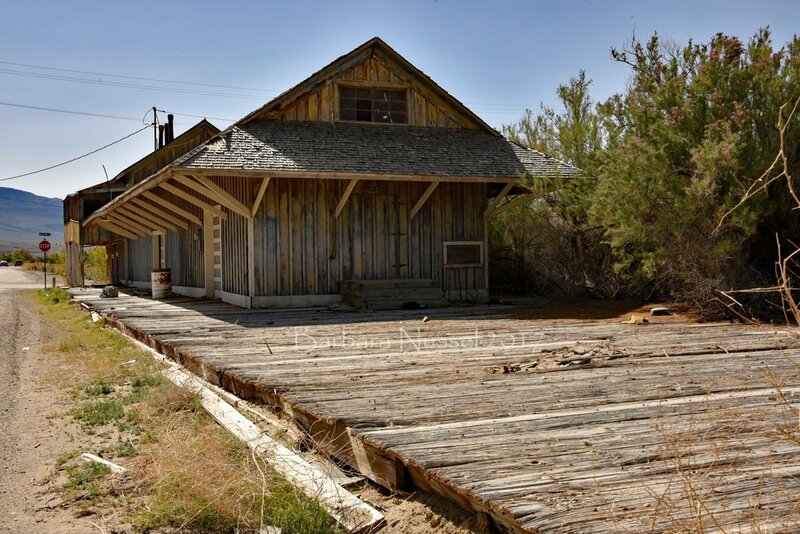 The original mill was built in 1914 by the Ashford brothers, to process ore from the Golden Treasure Mine 5 miles to the east in the Amargosa Range. Generally most of the over 140 metal mining adventures which sprang up in Death Valley over the past 150 years were “fading fortunes”. One of the earliest successful mining operations was the Harmony Borax Works, which was active from 1883 to 1888. This mill was famous not for its ore deposits, but for the Twenty Mule Team wagons used to transport the partially refined borax. In the early 1900s renewed interest in gold and silver mining, revived some of the dying mines, and delayed the death of some of the mining towns, like the before mentioned town of Bodie further north. Here in the Death Valley area a few new mines, like Rhyolite, and Keane Wonder became large-scale operations, and boom towns sprang up around these mine. But it was once again a short lived boom. Prosperous large-scale metal mining in Death Valley ended around 1915. Rhyolith is one of the more easily accessible ghost towns, just off the road (Hwy 374) from Furnace Creek to Beatty, NV. You can find several remnants of Rhyolite’s glory days. Some of the walls of the 3 story bank building are still standing, as is part of the old jail. The train depot (privately owned) is one of the few complete buildings left in the town, as is the Bottle House. Shooting these whitish concrete ruins on a full moon night, with only the sounds of wild animals, primarily burros, gives you quite an eerie feeling, but it is amazing how much light a full moon can provide, when you are in a none-light-polluted area. Death Valley has such interesting geology. I love the many colors and shapes. Rock formations which look like almond-fudge ice cream, the beautiful hues at Artist's Palette in the late afternoon, or hiking Golden Canyon late in the afternoon, and you look, and you nod, and you think "Yep, that's why they named it Golden Canyon!". Heading out of Death Valley on CA-190 East, in time to catch the Mesquite Flat Sand Dunes at sunrise, will take you to the almost dry Owens Lake, and another almost ghost town, before you connect to CA-395, the major north-south traffic artery in the Eastern Sierra. 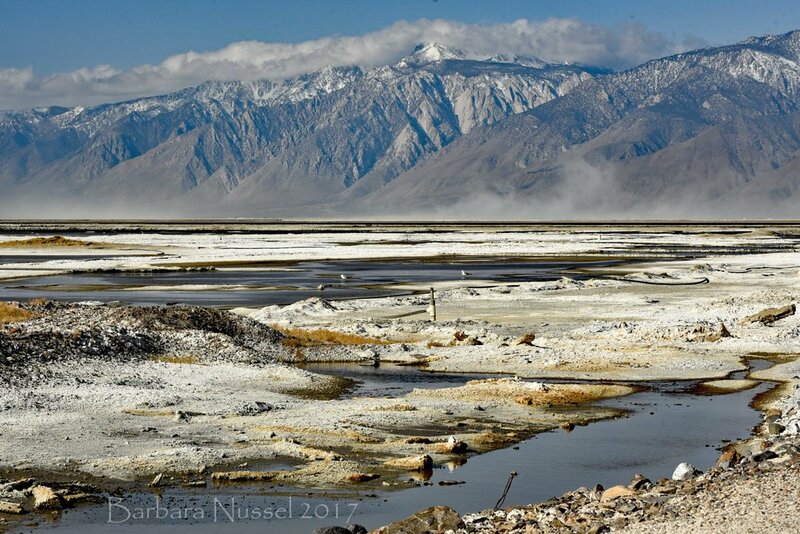 Owens Lake use to be a lake filled with water – until in the early 20th century, efforts to channel water from the eastern slopes of the Sierra Nevadawas identified as a solution to provide water-hungry Los Angeles with the water it needed so urgently for its further growth. The Los Angeles Aqueduct was built, and completed in 1913. As a result of these water exports Owens Lake dried up by the 1920’s, causing alkali dust storms to plague the area. As I passed by, Owens Lake had a little bit of water, but I also witnessed the dreaded dust storms, which are a serious environmental and health issue for Owens Valley, and beyond. Keeler on the eastern shores of Owens Lake, is another mining ghost town, I should probably say “almost ghost town”, because, I guess, as long as there is a Post Office and “Lots For Sale”, the town is not dead yet. In 1880 the Owens Lake Mining and Milling Company built a new mill in Hawley (as Keeler was known back then) for processing silver ore from the Cerro Gordo Mines in the mountains to the east. Due to the success of the Cerro Gordo mines Keeler boomed – until silver prices plummeted in the late 1800s. 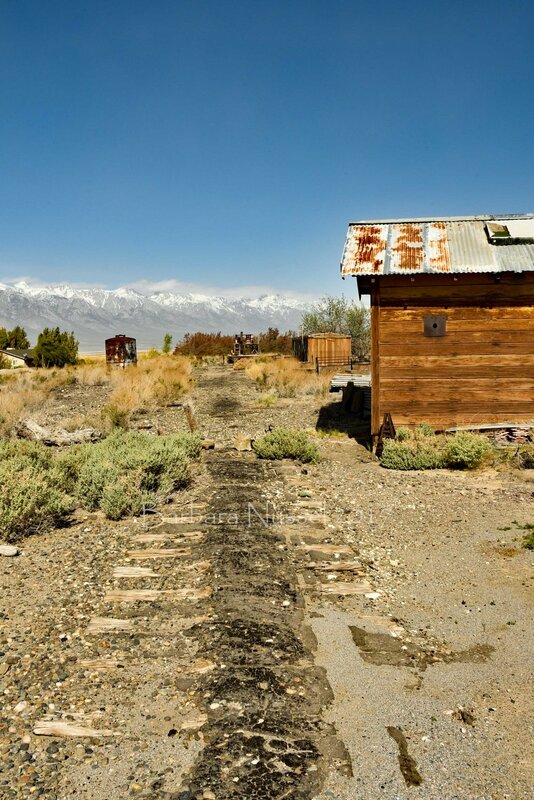 The Carson & Colorado Railroad, built in 1880, running from Mount House, NV to Keeler, CA, was advertised as the “direct, shortest and cheapest route for freight and passengers to mining towns and camps along the Eastern Sierra”. A second boom of zinc mining in the early 1900s brought new life to the town and a tramway was built to bring the ore from Cerro Gordo to Keeler. However, by the 1950s all mining had ceased. The C & C RR was never extended to Mojave, as originally planned. Keeler became “the end of the line”, and in 1960 train service was stopped all together and the tracks were removed in 1961. Today Keeler is practically a ghost town. Many of the buildings are falling apart. 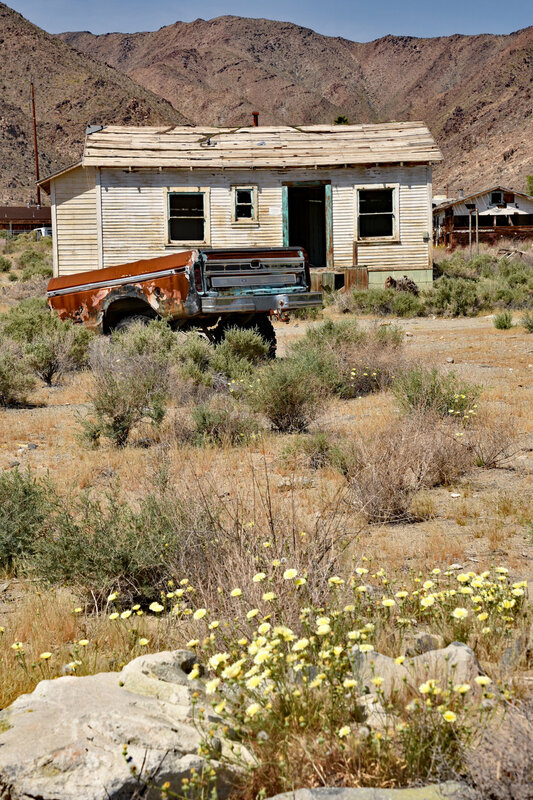 “Ghost towns in the making” are not yet picturesque like the Ranger-managed, ‘arrested decay’ ghost town of Bodie. The places are abandoned, often vandalized. Rubbish is strewn all across the abandoned properties or junk is piled up high by someone hoping to put it to use or make some money off it. Occasionally you will find the creative local taking an artsy approach to some of the metal junk. There is a beautiful old gas station on the north side of town, but the gas station is filled with and surrounded with all sorts of discarded “antiques”. If Keeler were a tourist hotspot, this gas station would be all cleaned up and an attractive photo opportunity. Places like Keeler where people don’t mind someone living in an old school bus, are home to down-on-their-luck folks, to people for whom this is ‘the end of the line’. Once you’re hitting CA-395 in Lone Pine, there are many opportunities for further stops and explorations along this very scenic route, all depending on how much time you have. As I had just visited the Ancient Bristlecone Pine Forest and the Bishop area last fall, I voted for a quick exploration of the Alabama Hills, just west of Lone Pine. Walking, hiking, and climbing around the various rock formations, you immediately understand why the Alabama Hills are a popular filming location for television and movie productions, especially Westerns. Since the early 1920s, 150 movies and about a dozen television shows have been filmed here. 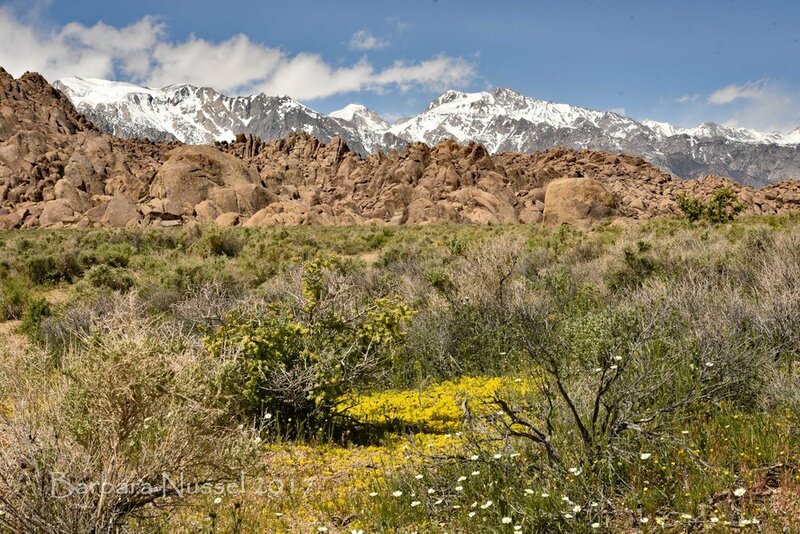 You can pick up a map in Lone Pine and follow, unpaved, “Movie Road” in the Alabama Hills to explore some of these movie locations, but watch where you step, as there are plenty of beautiful, little wildflowers. Heading north on CA-395 I went from desert climate and 90 F (32°C) degree weather to snow showers and freezing temperatures by the time I made it to Mammoth. As I was coming down from Deadman Summit on Hwy 395, and caught my first glimpse of Mono Lake, I knew I had to stop at the Mono Lake South Tufa State Reserve! The color of the Lake was just amazing. Down at the lake I was surprised that the water level of Mono Lake was not higher, with all the rain and snow northern California received this winter. With storms already hovering over the Sierra, and moving down fast, there was no reason to hang around in hope for a spectacular sunset at the tufas. Through on-and-off snow showers I continued north on 395, passing the turn-off to the already mentioned ghost town of Bodie. I would have loved to take a look at Bodie in the snow, but the road to Bodie is still closed. It is a very scenic drive from here through Walker River Canyon and Carson Valley to Gardnerville, NV, from where I headed west to South Lake Tahoe. By the time I reach South Lake Tahoe, it was snowing pretty hard, and I awoke to a beautiful winter wonderland the next morning. I was fortunate that Carson Pass (CA-88) was open, although the road was partially snow covered. Coming from Death Valley I was just absolutely amazed how much snow was still there in the Sierra. But it disappeared within the blink of an eye as I dropped below 6,000 ft (1800m) on the west side of the Sierra Nevada. All of a sudden, instead of driving between walls of snow, I was cruising through wine country towards Lodi, a small town in the northern part of California’s Central Valley. If you have never been to Lodi, as I hadn’t, doing the “Lodi Walldog Murals” walking tour, is a good way of seeing downtown Lodi, and learning about its history through some of the murals. There are also plenty of opportunities for wine tasting in and around Lodi, as Lodi is best known for being a center of wine-grape production, and its Zinfandel wines have become quite respected in recent years– a fact I was not aware of. So maybe next time, instead of going on a wine tasting trip to Napa or Sonoma Valley, you might want to try Lodi. Through farmland, mostly vineyards, I continued west towards Rio Vista, and then back to the Bay Area through the Sacramento River Delta.